1. Whisk red wine vinegar, extra virgin olive oil, garlic and salt and pepper in a bowl. Add mozzarella slices and put aside, to let the cheese marinate in the mixture, about 5-10 minutes. 2. Wrap one basil leaf around each slice of mozzarella. Put one folded slice of salami on top and push skewer or toothpick through. 3. Arrange skewers on a plate, drizzle lightly with extra virgin olive oil, and add a dash of freshly ground pepper. How to fold the salami: Of course, you can fold the salami any way you prefer. I like to fold the round slice in half, then fold that in half so it somewhat resembles a triangle. I fold the point over, then fold the sides across to form a sort of square. My Notes: Red wine vinegar vs. balsamic vinegar: The plain combination isn't bad. It's mellow, it's pure -- but it's plain. I first tried these skewers with balsamic vinegar, olive oil and garlic but it didn't taste quite right. I normally love the taste of balsamic vinegar but I found it to be overpowering in this recipe. I preferred the light tartness of red wine vinegar. It adds a rich, pungent element without drowning out the freshness of the basil and the heartiness of the salami. Can I use a different deli meat? Certainly! I imagine this recipe would work perfectly with pepperoni. However, because mozzarella and basil are very Italian ingredients, I recommend using meats common of that culture to finish off this appetizer. I first tried this drink during my recent trip to Europe and now, each time I drink it, I'm immediately reminded of the cool, crisp air of Switzerland, the rustic beauty of Lake Lucerne. After a full day of sightseeing, my uncle had gone to the store and purchased some cocktail ingredients to help us unwind and prepare for dinner -- an apéritif, if you will. Fortunately, he kept it simple: Four Roses Bourbon and Sprite. No elaborate lime twist, no paper umbrella perched on the glass. It was just a sophisticated, clean cocktail. I was delighted to taste both ingredients without the rough burn of the bourbon rushing down my throat. The best thing, though, is that you can easily tailor this drink to your tastebuds. If you like the full, strong flavor of bourbon you can use less Sprite. But if you find the liquor too much to handle, you can pour more Sprite. And of course, you can always serve this as a mixed shot. 1. Combine ingredients and stir. Cheers! For a drink/cocktail, build ingredients over ice. If you want the bourbon to stand out more, you can try 1 part bourbon for 3 parts Sprite. Why Four Roses Bourbon? 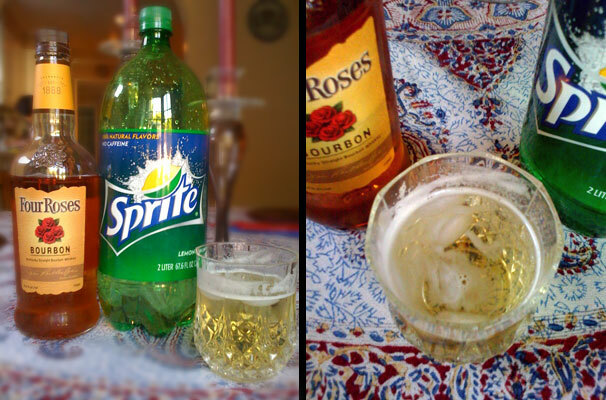 I've also tried Sprite with Jack Daniels whiskey and though I enjoyed that, I found Four Roses to make for a better, more universally-liked drink. The end result is a bit sweeter, and more floral-tasting than the Jack Daniels version. Also, because the only other component to this concoction is Sprite, you should be sure to use a bourbon or whiskey you really like. This "Kentucky bobo," as my good friend likes to call it, can be found at your local BevMo and at most liquor stores. It's a good quality bourbon with a fair price, about $20 for the 3/4 liter bottle. This quick little recipe combines three tasty, savory ingredients: prosciutto, basil and French bread. It's light, it's salty, it's herby, it's crunchy. Would more could you want in a finger food? Just be sure to use the freshest ingredients so each one can stand out on its own. Since it's a Martha Stewart recipe, I'll have to admit it's perfect. I didn't change a thing -- the only thing I did differently was use a toaster oven (and write up a simpler ingredient list). 1. Lightly brush both sides of each bread slice with oil. Season with salt and a little bit of pepper. To heat, using an oven: Preheat oven to 400 degrees. 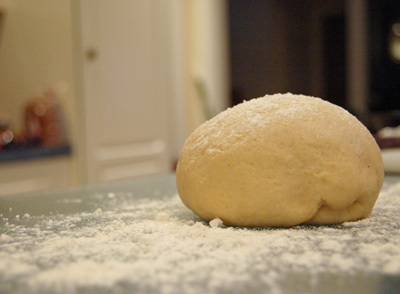 Transfer bread to a rimmed baking sheet. Toast in oven until pale golden, about 5 minutes per side. Transfer sheet to a wire rack or plate; let crostini cool completely. To heat, using a toaster oven: Preheat toaster oven to 300 degrees. Toast bread until pale golden, about 3 minutes per side. Transfer sheet to a wire rack or plate; let crostini cool completely. 2. Place two basil leaves and a folded slice of prosciutto on each bread slice. Drizzle lightly with oil. Season with a little bit of freshly ground pepper. My Notes: Oven or toaster oven? I'm sure most chefs and many foodies would insist you use a regular oven. But if you have a small kitchen like I do, you probably don't want to heat up that corner of your living space for a few slices of bread. I prefer to use the toaster oven because it uses less energy and the bread heats faster. What kind of prosciutto? Because this recipe calls for so few ingredients, it's important to make sure you use good quality ones. You could go with a pre-packaged prosciutto but I find those sometimes tend to be a bit slimy. I prefer to use freshly-sliced Canadian prosciutto from the Whole Foods deli. It's definitely not soggy and is quite lean -- just the way I like my prosciutto. Why freshly ground pepper? Believe it or not, freshly ground pepper tastes different from the more commonly-used coarse grind pepper. Grinding the peppercorns releases their oils and greater flavor. Plus, this fresher variety makes your finished crostini look even more beautiful.